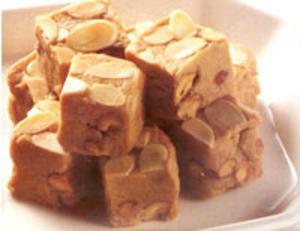 • Extra toasted, crushed, slivered, flaked or whole almonds for decorating the surface of the fudge (optional). 1. Gently melt the butter in a heavy 5-litre/quart saucepan over low heat. Add the sugar, increase the heat to moderate and, stirring constantly, cook for about 3 minutes or until the sugar melts into the butter and becomes frothy. 2. Cook for a few minutes more until it develops a light caramel colour. The caramelised sugar will give off a light toffee fragrance. Be careful to avoid over-darkening the sugar at this point; excess caramelisation will give the fudge a bitter flavour. The butter will probably be completely separated from the caramelised sugar at this stage, but that's normal. 3. Remove the pan from the heat and allow it to cool for 2 or 3 minutes. Stir in the cream and nuts. Using a wire whisk, gradually mix in the powdered milk a little at a time, whisking vigorously to avoid forming any lumps. When the mixture just hangs onto the whisk, it is ready. If it reaches this stage before you've added all the powdered milk, don't add any more. If it's still too runny after adding it all, add a little more. 4. Very lightly butter a 25cm-30cm (10-inch – 12-inch) tray. With a spatula, scrape the hot fudge mixture into the tray. Smooth it out and sprinkle the top with the optional nuts. Allow the fudge to set in a cool place for 1 hour. Cut into approximately 3.75cm(1-inch) squares, and stand back.